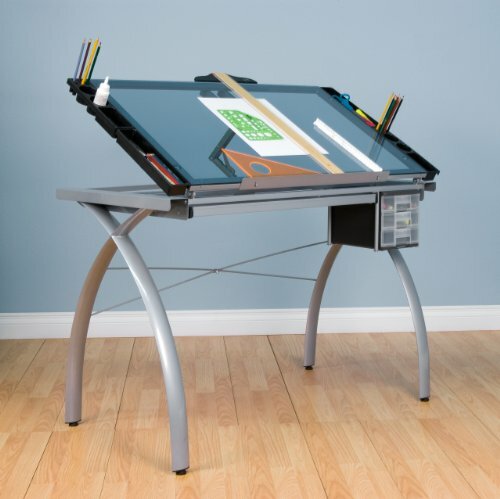 We set off to find the ten best drafting tables as sold by Amazon. If your work requires you to create artistic designs, one of these drafting tables will most likely come in handy. Read on to locate the best drafting table for you. 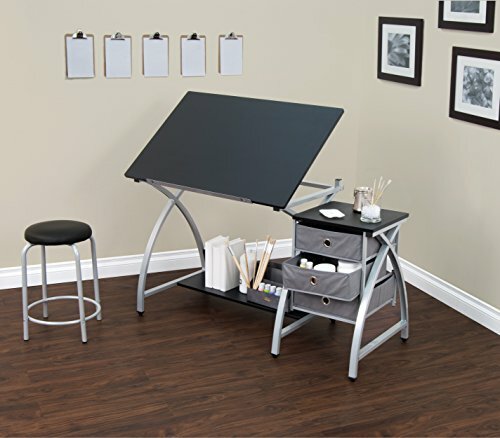 The Deluxe Craft Station by Studio Designs is another drafting table that makes it to our top ten list. 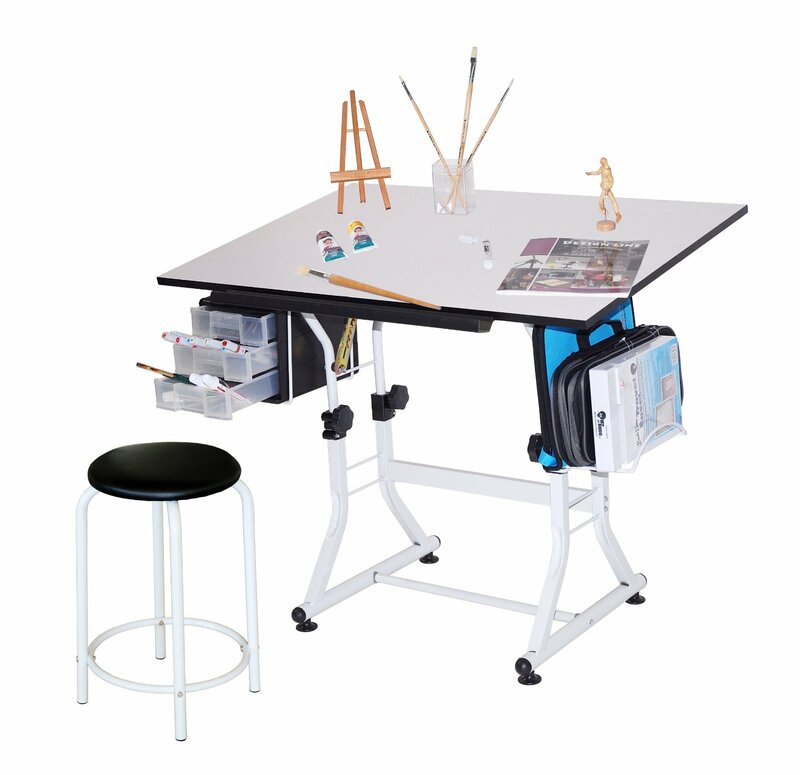 It features a huge and comfortable work surface plus a space to keep most of your supplies. 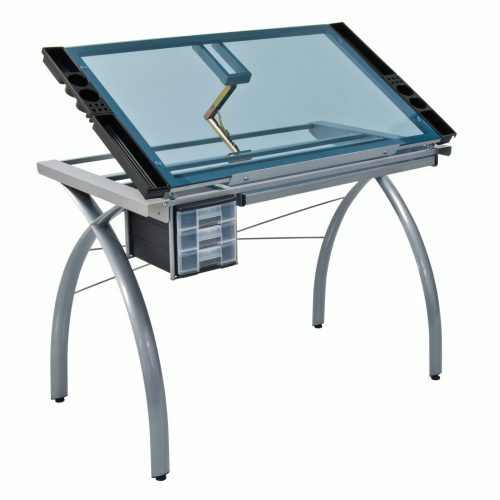 The table top quickly adjusts all the way to 40 degrees to create a convenient position for you to work on. 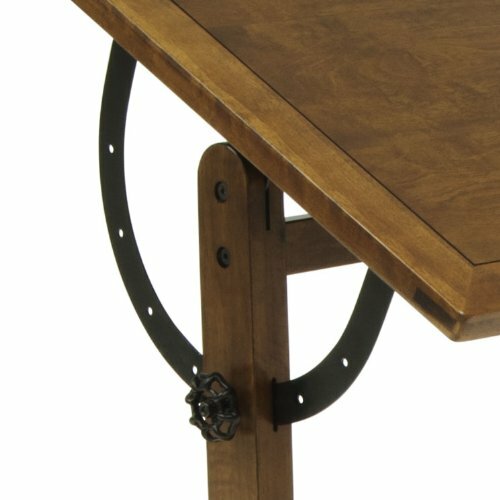 All you have to do to achieve your desired angle is to tip the top part of the table and lock it into place. It is also worth noting that the unit comes with 3 slide drawers and 4 side trays to give you ample storage space. 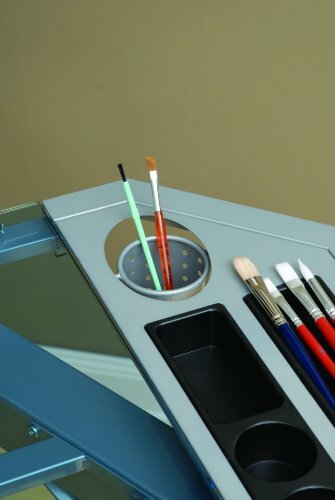 A 24-inch pencil ledge is also available to slide up and lock into place as and when required. 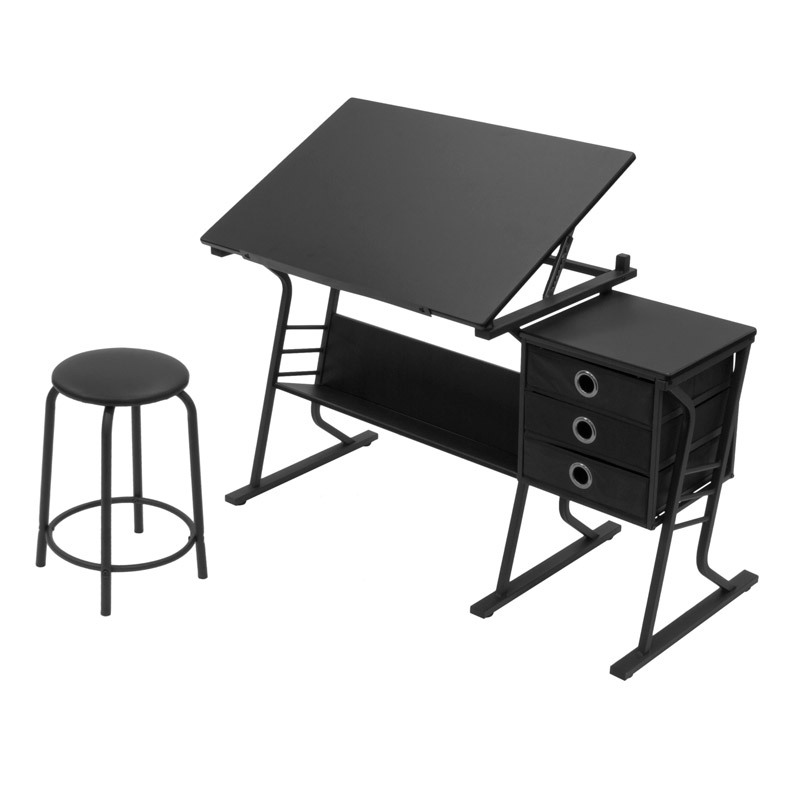 This beautiful 3-piece drafting table by Studio Designs is the definition of affordability, convenience, and comfort. Studio Designs 13364 Eclipse Center, Black with Whitefeatures a table top that can be adjusted up to 40 degrees to create a comfortable workspace and keep all your supplies within reach. It has a 24-inch pencil ledge that easily slides up and then locks into place as needed. 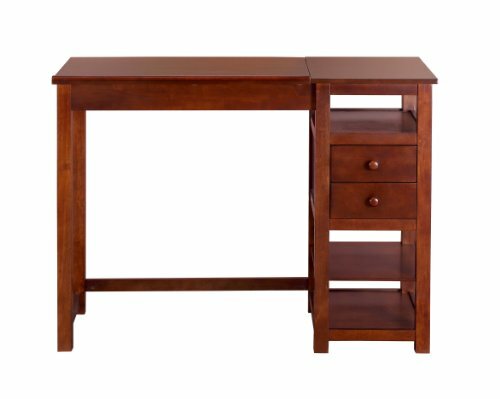 Additionally, the set has a set of three conveniently placed drawers for storage purposes when the table top is full of activity. It is also worth noting that it comes with a padded stool that’s just the right height for the table. 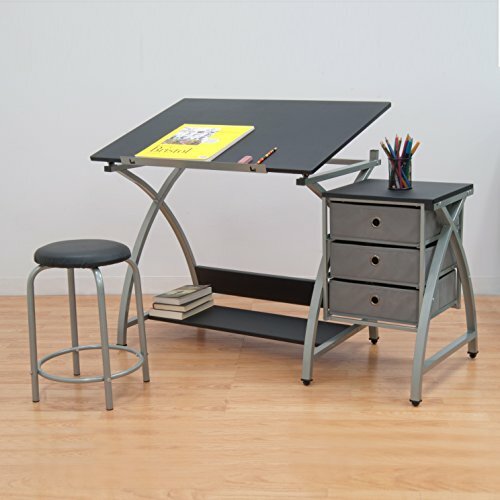 With regards to construction, the drafting table has six-floor levelers made of durable heavy steel. CraftMaster Drafting Table by Alvin is yet another classic addition to your home workstation as far as arts and crafts are concerned. It boasts a sturdy tubular steel construction with a powder-coated finish that’s just hard to resist. 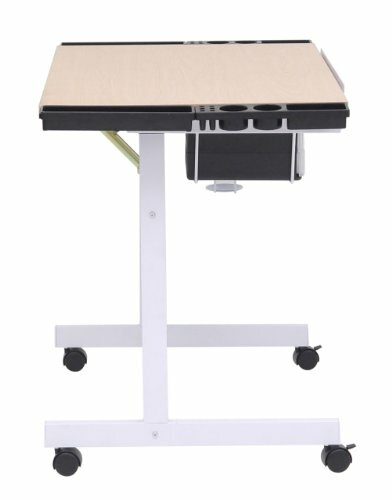 Its laminate tabletop features rounded corners creating a comfortable workspace where you can keep your supplies within reach. The drafting table can be adjusted all the way to 30 degrees thanks to its one-hand tilt-angle mechanism. Additionally, it comes with two storage units with three drawers each. 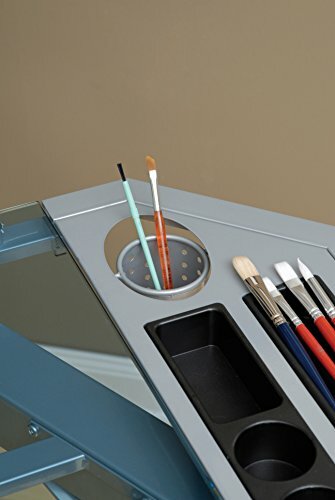 A plastic instrument tray and metal pencil ledge are also included. And you do not have to hurt your legs once you pull up your chair as there is 21 inch of legroom available. 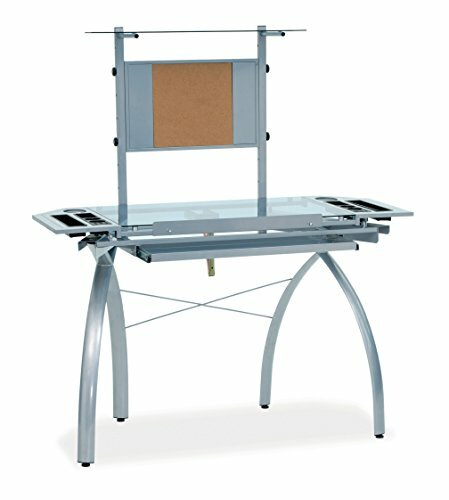 This versatile drafting table from Coaster home furnishings will be another excellent addition to your home’s workspace. 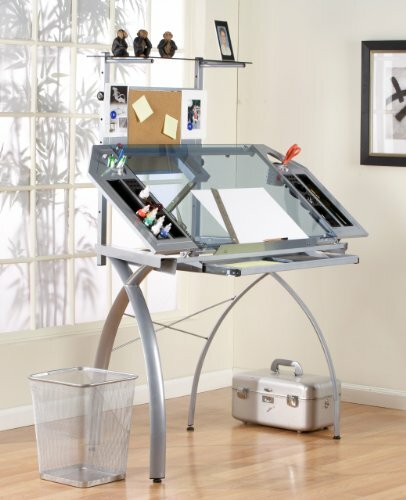 Coaster Desks Artist Drafting Table Desk features a generous table with a clear tempered glass top that easily tilts whenever you want to draw or read. Additionally, it has a lip at its lower end to ensure that your work is kept in place when the top is lifted. Its solid metal construction and sophisticated gray finish will definitely match up your home’s décor. A mini cabinet on the side is yet another noteworthy feature that makes this unit a must buy. 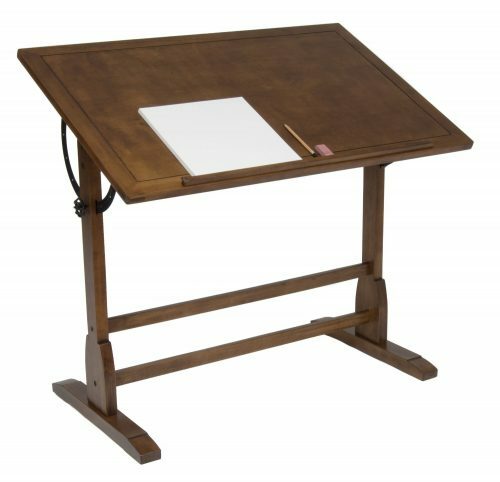 The simple yet stylish design of the vintage drafting table by Studio Designs is one of the main reasons why customers flock to buy it. 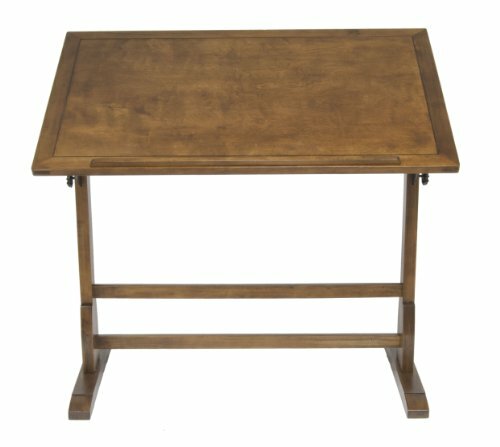 STUDIO DESIGNS 42in Vintage Drafting Table Rustic Oak 13305 has a spacious 42-inch workspace on an elegantly designed wood with inbuilt pencil ledge. 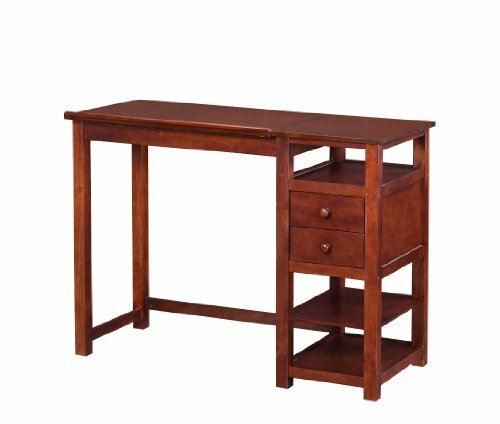 Its antique finished top adjusts all the way to 90 degrees to offer you a comfortable and convenient workspace where you can also store your items. The drafting table is constructed with solid wood frame for stability and durability. Its antique finished top adjusts all the way to 90 degrees to offer you a comfortable and convenient workspace where you can also store your items. 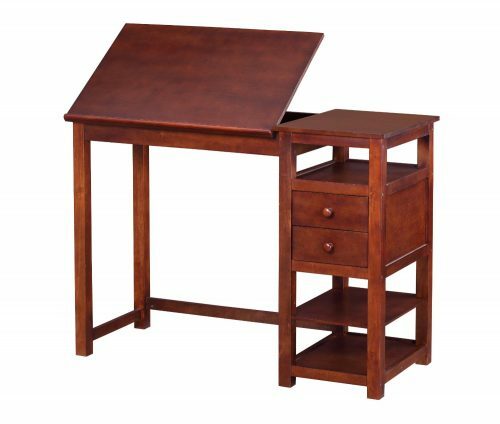 The drafting table is constructed with solid wood frame for stability and durability. Additionally, it features a 24-inch pencil ledge that lets you slide the table and lock it into place as needed. 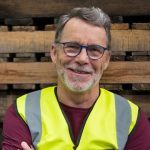 It also has three adjacent drawers on the side to give you ample storage space plus a padded stool that’s just too comfortable you can even sleep in the middle of work. 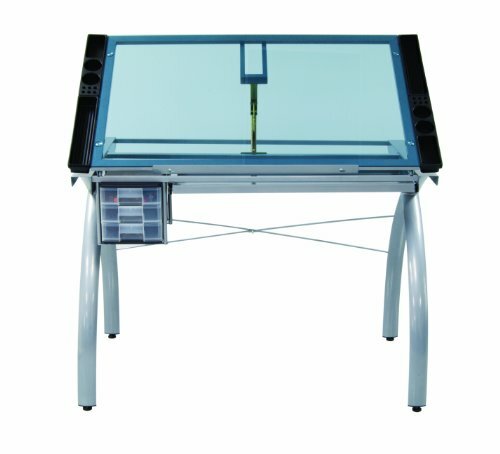 This small but perfect drafting table from Studio Designs is great for crafting and drafting all thanks to its spacious tempered blue glass top. The glass surface adjusts all the way to 35 degrees. 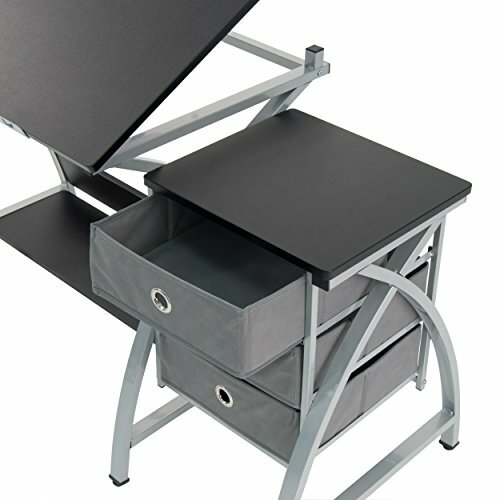 Studio Designs 10050 Futura Craft Station, Silver Blue Glass features one large pencil drawer, three slide-out drawers for supplies and four removable side trays for additional storage. Additionally, it has a 24-inch pencil ledge that slides up and then locks into place to keep all your pens and pencils safe. Its solid heavy-gauge construction and powder coated finish plus four levelers for stability make it an excellent addition to your home workspace. 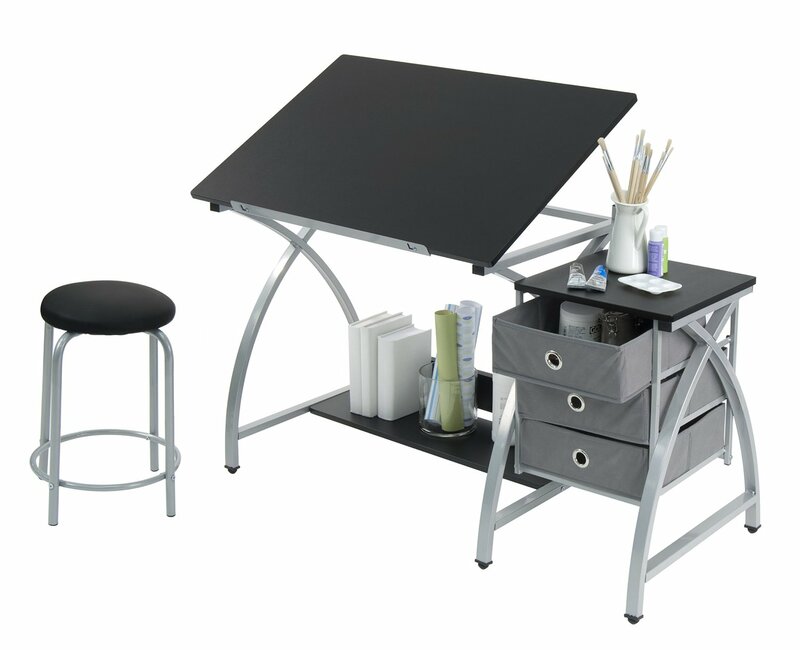 The Futura Tower from Studio Designs provides ample space to store all your supplies. With a table surface of 33 inches W and 21 inches D, you will certainly be treated to a grand workspace. It has a blue tempered glass top and a 24 by 9 inches lower shelf to offer you everything you could wish for. The table adjusts up to 40 degrees in six different angles to suit your preferences. Constructed of durable steel with powder coated finish, durability and stability aren’t out of the question. Additionally, it has a 24-inch pencil ledge that slides up and then locks into place as and when needed. The Martin Ashley Drafting Table has a workspace that measures 23.5 inches by 35.5 inches. 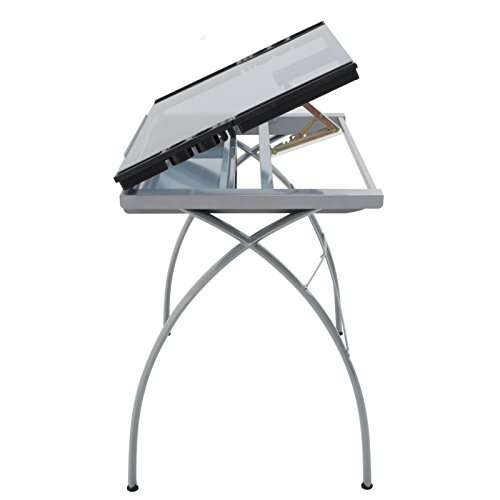 Its height can easily be adjusted from 26 to 30.5 inches for convenience and comfort when working. The table has boot guides which allow it to be tilted easily. It comes with a pencil trough for storing pencils, pens, brushes and any other items. Additionally, it features three drawers on one side and a foldable utility rack to provide extra storage space on the other side. 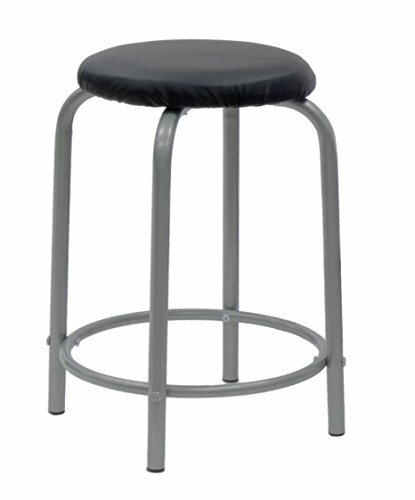 You will be thrilled to know that it comes with a padded stool that is just the right size for its height. 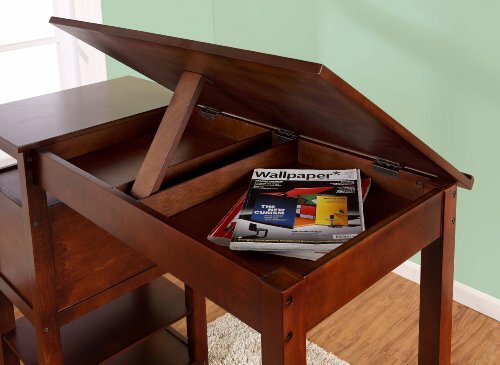 Look for a drafting table that can be slanted. This way you wouldn’t have to lean forward all the time. It also helps to avoid back and neck problems in the future. Obviously, you also need to consider the amount of work surface you will need. 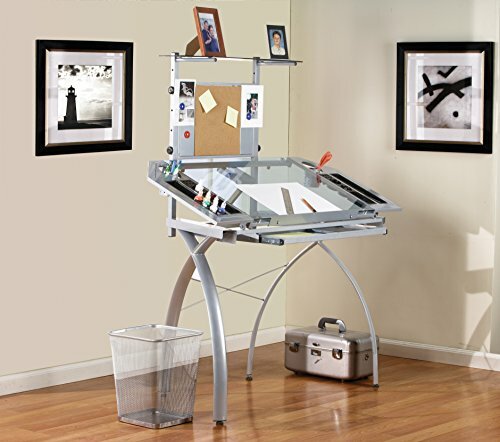 Whether you’re looking for a small drafting table or a big one is entirely up to your preferences. 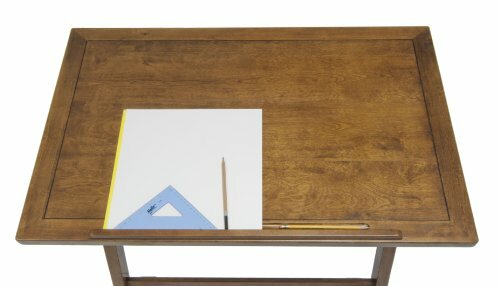 If you’re buying a drafting table for home use, consider a lightweight table that can be easily moved around to create additional space. If you’re buying for an office environment, look for a heavier more durable one. 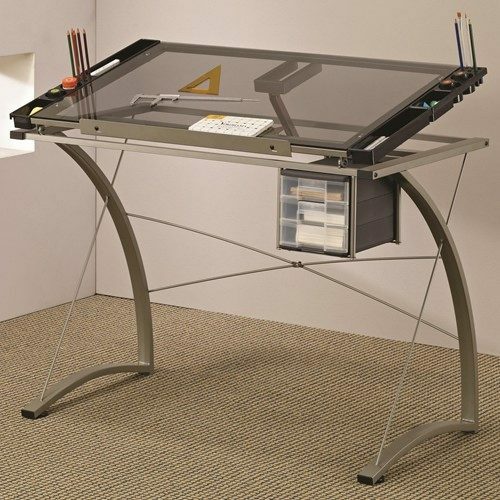 Look for a drafting table that can tilt to suit your different needs. Generally, most tables will tip from 30 to 40 degrees. If you want more tilt angle, be sure to look for one with a steeper tilt angle. Besides the inclined surface, you may want an extra side table with a horizontal surface to store your stuff. 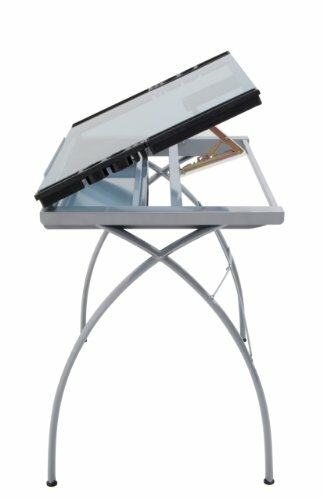 If you want more space to store your laptop or a place to put your other accessories, then looking for a drafting table with a horizontal side table will be a great plus for you. 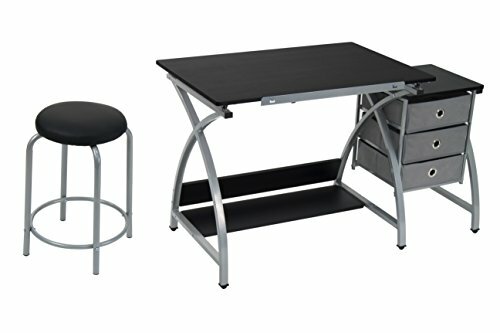 If you’re going to be spending long hours drawing or drafting, you do not want to be constantly banging your legs and knees on obstacles such as metal rods beneath the table. Check underneath the table for any obstacles before buying. Consider the type of additional features you would like to have. Some tables have lockable drawers to protect your items. Others have armrests and footrests to provide maximum comfort. There are also in-built rulers and slide up pencil ledges that will come in handy in the course of your work. 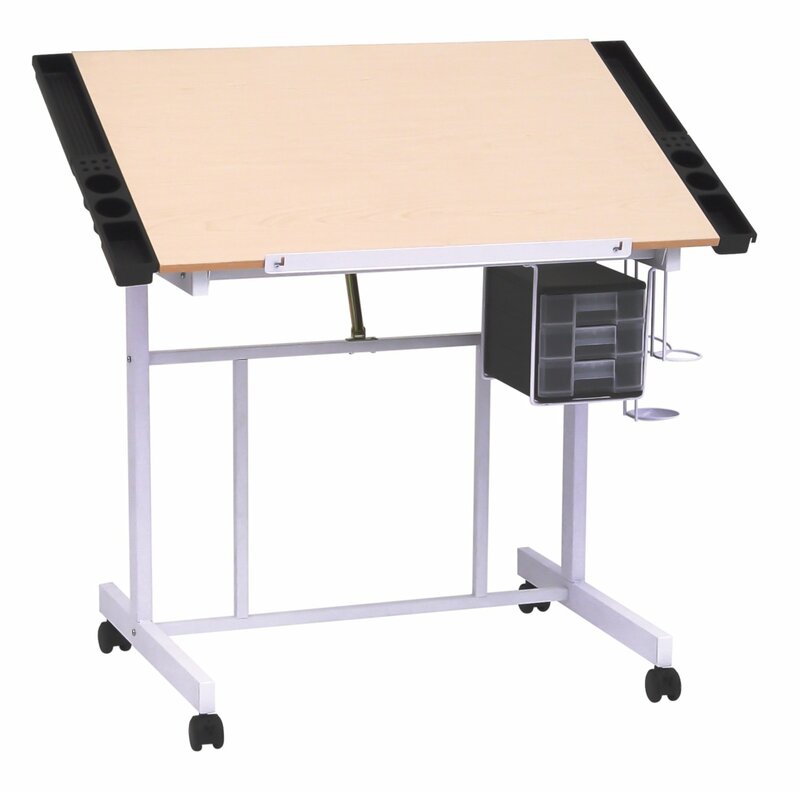 Also, decide whether you’ll need a drafting table with adjustable height. Some people like to be seated when drafting so a table that can be adjusted to allow you to use a chair comfortably will be great. 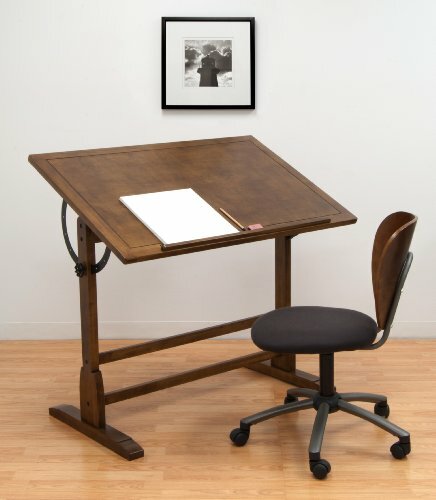 Fixed drafting tables offer a four-post design and are typically between 30 to 37 inches in height. 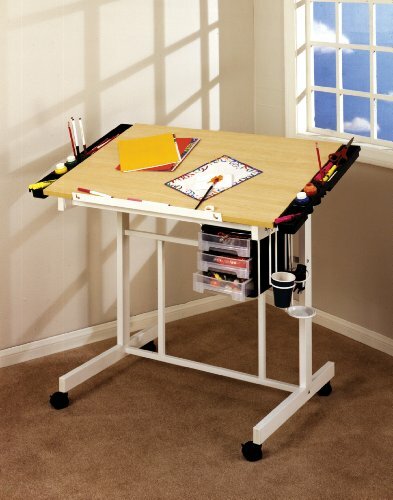 The 13251 Deluxe Craft Station is our number one pick in this review. 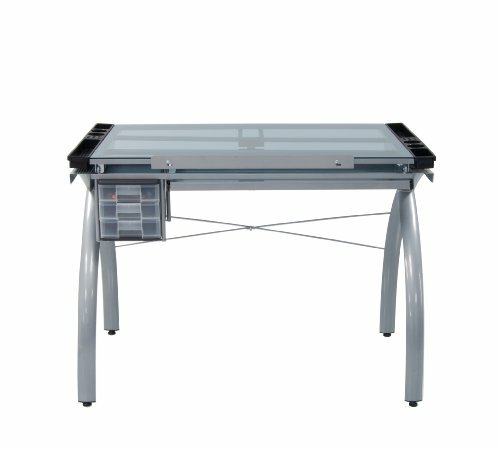 It is a well-designed drafting table that consistently receives high ratings from customers on Amazon. It tops our list thanks to its unsurpassed standards in quality, durability, convenience, and comfort. It has been uniquely designed to give you the kind of high-end working space you deserve. With all its amazing features, it definitely makes for the ideal work partner for elite drafting comfort.